I am grateful for all of my clients! In an effort to let them know how grateful I am… I am going to start doing an occasional feature on each client. This month’s feature is on Toni Tierney. Toni is a fashion designer for children’s clothing. I decided to pick Toni this month because of her mission and how it relates to the current state of affairs with the American economy. In addition to fashion design, Toni has also just released a new line of art work for children’s room. In the spirit of giving I am hosting my first official blog contest. I am going to give away one adorable brand new outfit created by Toni Tierney. 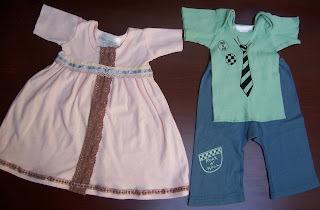 The winner can choose between an infant size 6 boy outfit or an infant size 12 girl dress (see pictures below). To enter the contest you must be a US or Canadian resident (because of shipping costs) and all you need to do is comment on my blog and let me know which outfit you want to win. Also, it’d be much appreciated if you tell others about this contest by blogging about it but blogging about this contest is not a requirement to win. On December 10th, 2008 I will have my daughter (who never reads my blog) pick a number and whoever has the comment that matches that number will be the winner. (For example… she picks number 7 and you are the 7th poster then you are the winner kind of thing.) I will then post the winning number and ask you to contact me to let me know which outfit you want and to get your mailing address. Winner must respond by December 12th, 2008 or we will pick a new number. The package will arrive before Christmas if you want to use it as a gift. Toni Tierney’s adorable clothing is sold in baby boutiques all over the country. Sally, this is a great givaway! My daughter is probably to big for the cute little girl’s outfit, but I just found out today that my cousin is having a boy, so that would be a wonderful gift for her! So, mark me down for the boy outfit if your daughter draws my number. Fantastic contest, Sally! I have seen your client’s site before and the clothing is simply adorable – my son is already ten (gasp!) but I have nieces and nephews who are still little ones. I love that your client hires moms and supports them working at home. More people should follow her example. If I win, I would love the little girl dress! Adorable!! Thanks for such a cool contest!! Thanks for the great giveaway/contest! I love Toni’s designs! Also I love cotton! Sally, this is very generous giveaway and would make an awesome Christmas gift for my nephew. If I win I would love the little boys outfit. The contest is officially closed! Thank you participating!